Tyrone most recently played the roles of Obi in Leave to Remain at the Lyric Hammersmith Theatre and the lead role in the world premiere of Philip Ridley’s Angry at The Southwark Playhouse. He is currently making his directorial debut for Ain't Misbehavin' at the Mercury Theatre, Colchester and Southwark Playhouse, London. Prior to this, Tyrone appeared in Lin Manuel Miranda's 15 minute musical 21 Chump Street and played The Academic in Homos, or Everyone in America at the Finborough Theatre. Tyrone won the Evening Standard Theatre Award for Emerging Talent, the Mousetrap Award for Best Actor and earned Olivier Award and WhatsOnStage Award nominations for his critically acclaimed performance as Judas in Jesus Christ Superstar (Regent's Park Open Air Theatre). He was also featured by ES Magazine as one of 10 of London’s hottest new talents to watch in 2016 and named on The Progress 1000 list of most influential Londoners (2017). Other theatre includes: Lysander in A Midsummer Night's Dream (Watermill Theatre); Male in Angry (Southwark Playhouse); C.C. White in Dreamgirls (Savoy Theatre); Gator in Memphis (Shaftesbury Theatre, BroadwayWorld Award nomination); Porgy & Bess (Regent's Park Open Air Theatre); Seaweed in Hairspray (Leicester Curve); Doctor in Book of Mormon (Prince of Wales, BroadwayWorld Award nomination), Genie in Aladdin (King's Lynn Corn Exchange); Lanx in Angel City (Edinburgh Fringe) and TJ in Sister Act (National Tour). After graduating from Mountview with a first class honours degree in Musical Theatre, Tyrone was awarded a Distinction for his Graduate Diploma in Law from The University of Huddersfield. 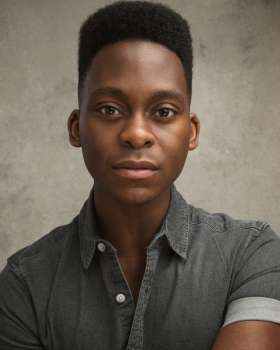 Tyrone Huntley sings "Bigger Things"